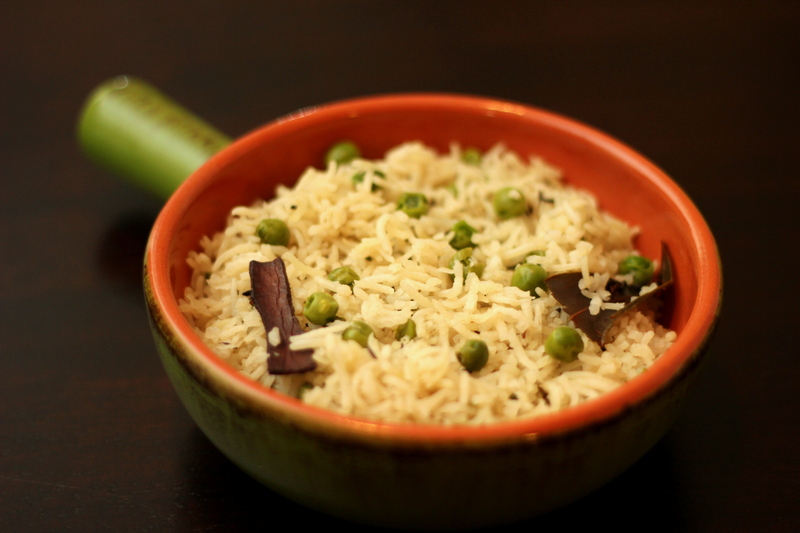 If you’re wondering why something as easy as jeera pulao warrants a blog post, it is more so you’re reminded of how it only takes a few extra minutes to make a regular meal feel like a whole special spread. This could be the one easy thing that you end up making for a special party, or even just to dress up that curry dinner you made during the week. But only you need to know that! 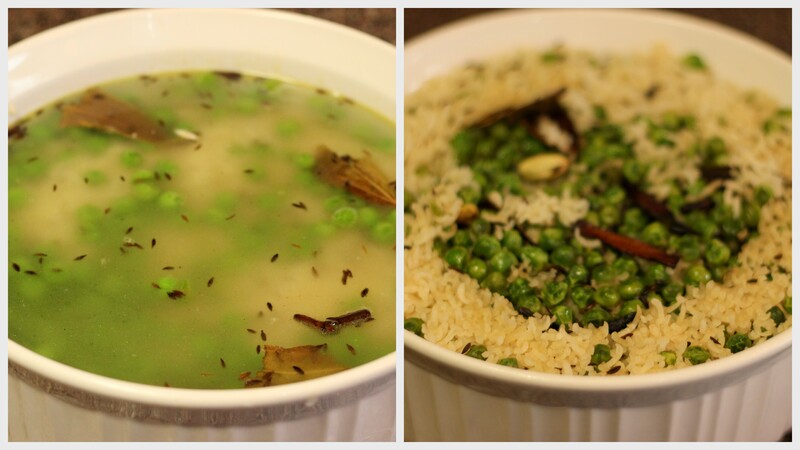 For a long time, I just used to make the version without peas – so it used to be plain jeera rice or ghee rice. But with a picky toddler around, when you are looking for ways to add more nutrition and veggies to meals, this dish sure does help. More so, when you don’t really have to worry about peas being fresh in-season, and could grab some right out of the freezer without having to bother with the peeling (or the worms, gulp!!). Heat a pan, add the cooking fat (ghee/butter/oil). Add the cinnamon, cloves, cardamom and bay leaf to the hot ghee/oil and allow to cook on med high for a few seconds until lightly brown and the aroma rises. Add the cumin seeds and saute for about 30 seconds or until this starts crackling in the hot oil – take care not to burn this or turn it black. 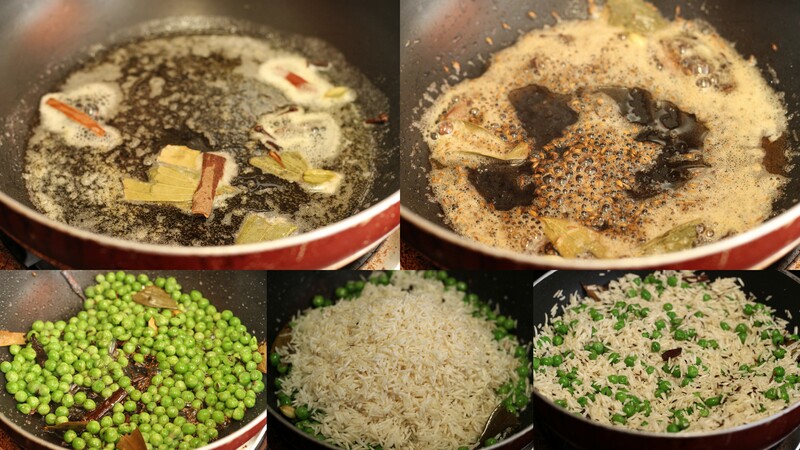 If using frozen peas, add the peas now and saute for a few minutes until they are thawed and a little cooked. If using raw green peas, semi-cook them before adding at this stage by cooking in the microwave or on the stove top with water and some salt, for 5-7 minutes. Add the raw rice and saute the mixture for 3-4 minutes until the rice grains are fully coated in the ghee and lose the milky white color (they start looking a little translucent when cooked in the oil). Add 2.25 cups water (just over twice the rice quantity, or as per instructions for rice variety). Cook the rice. To test if rice is cooked well, take a few grains and mash in between fingers. It should easily smooth-en out and get mashed, not be brittle or break into pieces. All the water in the rice mixture should have been used up and it should not be soggy anymore. Else, continue to cook for a few more minutes on low heat or microwave for another minute or two. Microwave method for cooking rice: Transfer the rice mixture to a microwave-safe container. Cook for 15-17 minutes depending on power level of microwave until rice is fully cooked. Stove-top method for cooking rice: Cook with lid-on in med heat for 15-20 minutes until the rice is fully cooked. Fluff the grains with a fork or spoon, and toss up the mixture to evenly distribute whole spices in it. Serve steaming hot with your favorite curry! Best meal to stock up in freezer, for that tired worn out day out, pop amd warm, eat andvhitvthe bed, right da? Houd jij ook al zo van speciaalbier? Bier is tegenwoordig gelijkwaardig met wijn. Lekker speciaalbier bestellen kan tegenwoordig ook makkelijk en eenvoudig online. Vele soorten speciaalbier, die je vandaag kan bestellen en morgen thuis kan ontvangen.